ਅੰਬੇਡਕਰ ਨੇ ਕਾਨੂੰਨੀ ਪੇਸ਼ੇਵਰ ਵਜੋਂ ਕੰਮ ਕਰਨਾ ਸ਼ੁਰੂ ਕੀਤਾ। 1926 ਵਿਚ, ਉਸਨੇ ਤਿੰਨ ਗੈਰ-ਬ੍ਰਾਹਮਣ ਆਗੂਆਂ ਦੀ ਸਫ਼ਲਤਾ ਨਾਲ ਬਚਾਅ ਕੀਤੀ ਜਿਨ੍ਹਾਂ ਨੇ ਬ੍ਰਾਹਮਣਾਂ ਤੇ ਭਾਰਤ ਨੂੰ ਬਰਬਾਦ ਕਰਨ ਦਾ ਦੋਸ਼ ਅਤੇ ਬਾਅਦ ਵਿਚ ਉਨ੍ਹਾਂ ਤੇ ਬਦਨਾਮੀ ਲਈ ਮੁਕੱਦਮਾ ਚਲਾਇਆ ਗਿਆ ਸੀ। ਧਨੰਜੈ ਕੀਰ ਨੇ ਨੋਟ ਕੀਤਾ ਕਿ "ਇਹ ਜਿੱਤ ਸਮਾਜਿਕ ਅਤੇ ਵਿਅਕਤੀਗਤ ਤੌਰ ਗਾਹਕਾਂ ਅਤੇ ਡਾਕਟਰਾਂ ਦੋਵਾਂ ਲਈ ਸੀ।"
↑ Jaffrelot, Christophe (2005). 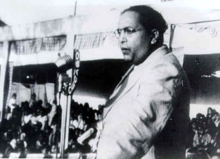 Ambedkar and Untouchability: Fighting the Indian Caste System. New York: Columbia University Press. p. 2. ISBN 978-0-231-13602-0. ↑ Pritchett, Frances. "In the 1890s" (PHP). Archived from the original on 7 September 2006. Retrieved 2 August 2006. ↑ "Mahar". Encyclopædia Britannica. britannica.com. Archived from the original on 30 November 2011. Retrieved 12 January 2012. ↑ Ahuja, M. L. (2007). "Babasaheb Ambedkar". Eminent Indians : administrators and political thinkers. New Delhi: Rupa. pp. 1922–1923. ISBN 978-8129111074. Archived from the original on 23 December 2016. Retrieved 17 July 2013. ↑ Ambedkar, B. R. "Waiting for a Visa". Frances Pritchett, translator. Columbia.edu. Archived from the original on 24 June 2010. Retrieved 17 July 2010. ↑ Kurian, Sangeeth. "Human rights education in schools". The Hindu. ↑ Daily Loksatta Dated 18/04/2014 Archived 20 October 2017 at the Wayback Machine. ↑ "Bhim, Eklavya". outlookindia.com. Archived from the original on 11 August 2010. Retrieved 17 July 2010. ↑ Pal, Sanchari (April 14, 2017). "ਭੀਮਰਾਓ ਦੇ ਨਾਮ ਦੀ ਬਦਲੀ". www.thebetterindia.com. thebetterindia. ↑ 10.0 10.1 Pritchett, Frances. "In the 1900s" (PHP). Archived from the original on 6 January 2012. Retrieved 5 January 2012. ↑ Pritchett, Frances. "In the 1910s" (PHP). Archived from the original on 23 November 2011. Retrieved 5 January 2012. ↑ "Ambedkar teacher". 30 March 2016. Archived from the original on 3 April 2016. ↑ "Bhimrao Ambedkar". columbia.edu. Archived from the original on 10 February 2014. ↑ "Rescuing Ambedkar from pure Dalitism: He would've been India's best Prime Minister". Archived from the original on 6 November 2015. ↑ Kshīrasāgara, Rāmacandra (1 January 1994). Dalit Movement in India and Its Leaders, 1857–1956. M.D. Publications Pvt. Ltd. ISBN 9788185880433. Retrieved 2 November 2016 – via Google Books. ↑ Keer, Dhananjay (1971) . Dr. Ambedkar: Life and Mission. Mumbai: Popular Prakashan. pp. 37–38. ISBN 978-8171542376. OCLC 123913369. ↑ Harris, Ian, ed. (22 August 2001). Buddhism and politics in twentieth-century Asia. Continuum International Group. ISBN 9780826451781. ↑ Tejani, Shabnum (2008). "From Untouchable to Hindu Gandhi, Ambedkar and Depressed class question 1932". Indian secularism : a social and intellectual history, 1890–1950. Bloomington, Ind. : Indiana University Press. pp. 205–210. ISBN 978-0253220448. Retrieved 17 July 2013. ↑ Jaffrelot, Christophe (2005). Dr Ambedkar and Untouchability: Analysing and Fighting Caste. London: C. Hurst & Co. Publishers. p. 4. ISBN 978-1850654490. ↑ Keer, Dhananjay (1995). Dr. Ambedkar: Life and Mission. Popular Prakashan. ISBN 9788171542376. ↑ Mookherji, Kalyani (2018). 7 Reformers who Change the World. Prabhat Prakashan. ↑ "Dr. Ambedkar". National Campaign on Dalit Human Rights. Archived from the original on 8 October 2012. Retrieved 12 January 2012. Chakrabarty, Bidyut. "B.R. Ambedkar" Indian Historical Review (Dec 2016) 43#2 pp 289–315. doi:10.1177/0376983616663417. Gautam, C. (2000). Life of Babasaheb Ambedkar (Second ed.). London: Ambedkar Memorial Trust. Kumar, Aishwary. Radical Equality: Ambedkar, Gandhi, and the Risk of Democracy (2015). Kumar, Ravinder. "Gandhi, Ambedkar and the Poona pact, 1932." South Asia: Journal of South Asian Studies 8.1-2 (1985): 87-101. Nugent, Helen M. (1979) "The communal award: The process of decision-making." South Asia: Journal of South Asian Studies 2#1-2 (1979): 112-129. 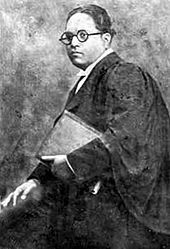 Ambedkar, Bhimrao Ramji. Annihilation of caste: The annotated critical edition (Verso Books, 2014).